Since I am leaving San Francisco after accidentally living here for a year and a half, I've been thinking about architecture, and the contrasts between buildings in the Bay Area, versus buildings in Los Angeles. Since the late 1960s, Tschumi has contributed greatly to architecture theory through his essays as well as his work. 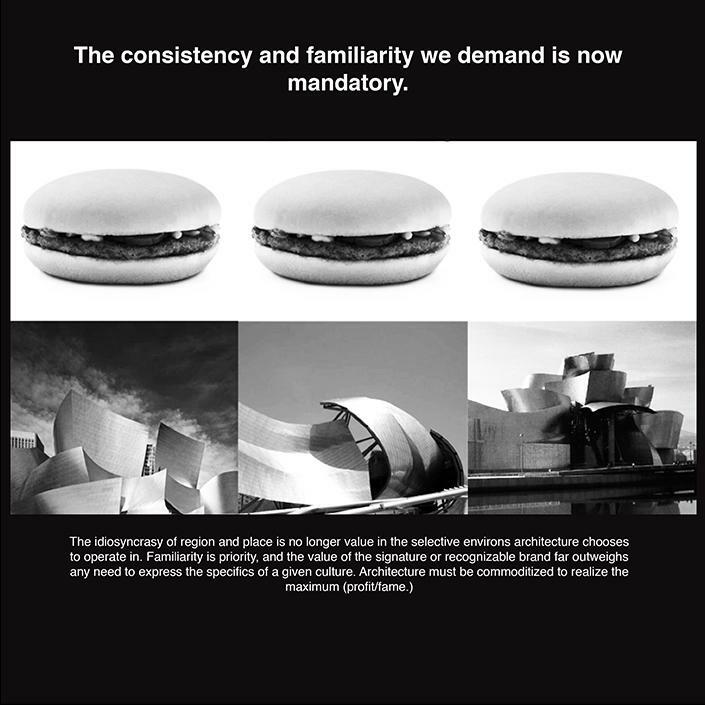 Basing his work on a main theory that there is no fixed relationship between architectural form and the events that take place within, Tschumi created a series, Advertisements for Architecture made between 1976-1977. These advertisements were printed on post card size pages intended for reproduction, as opposed to the single architectural piece. In creating these, Tschumi wanted to trigger a desire in the viewer for something beyond the actual post card, and to explore what commodification of architecture as 'products' would do in the interest in promoting the production of architecture. Tschumi's advertisements were also used to critique mainstream aesthetics, urban living and contemporary architectural works in general. Applying his theory that, "There is no way to perform architecture in a book. Words and drawings can only produce paper space, not the experience of real space. By definition, paper space is imaginary: it is an image" Tschumi's aim was to supply visual images juxtaposed with theory in order to discuss the disconnect between "the immediacy of spatial experience and the analytical definition of theoretical concepts." I've always thought of architects as sort of Utopic designers, imagining worlds where certain spaces are designated for specific activities. Looking at most architectural renderings, this Utopian vision is displayed in their portrayals of people using the space. Here someone is sitting, enjoying a snack, while someone else is walking by holding a child's hand. Another person behind them seems happy, and is pointing at something... But Tschumi's work is quite contrary given his theory that architecture's role isn't to express an existing social structure, but to function as a tool for questioning that structure and revising it. Tschumi's overt combination of theory with architectural space has left some accusing him of sacrificing people's needs for the sake of intellectual theory, but I'd argue that the traditional role assignments to buildings is what ultimately isolates people. A hospital has it's place in society, but should shopping be shoved into that same format? Consider the hundreds of abandoned malls all over the country... Perhaps the conventions of assigning use to specific space may be in need of Tschumi's deconstructivism.